Devon has made a huge mistake by leaving the side of his wife and the safety of the compound on a gamble that the plague of undead has run its course. On his own, with thousands of Tucson’s restless dead tracking his every move, is there any way he can hope to survive? He might have a chance with the undead, but his real enemy could end up being his fellow survivors. If Devon isn’t careful, he may find out that there are worse things than death, and those who have already perished were the lucky ones. 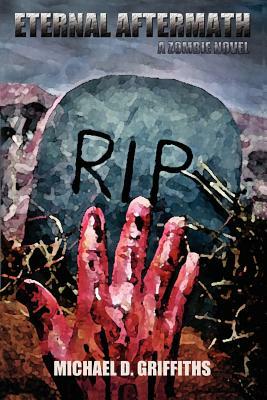 This is one of the latest offerings in the slew of zombie books avalanching onto our book shelves – a sub-genre of the horror market whose popularity shows no sign of abating. Griffiths’ first book was a modern take on Lovecraftian horror with his hero, Jack Primus hitting the road in an effort to overcome the terrors dogging him. Eternal Aftermath has a far more claustrophobic feel, as five years after the zombie-producing plague that enveloped the globe, the remains of the human race are reduced to living in armed encampments. And when Devon finds himself battling – in every sense of the word – to survive, he has to find his own hiding place. Energy crackles off the pages – a hallmark of Griffiths’ writing – and the plotting and narrative tension is also very polished. In between the action scenes, we get a chance to really get to know Devon as more than just an effective killing machine with a justifiable chip on his shoulder – which is so often the staple of these books. As a result, I really cared about him and his companions and found myself unwilling to put down the Kindle, but read on into the small hours to find out what would happen next. This isn’t my favourite genre by a long country mile. Partly because I’m rather squeamish, and partly because it is characters that always draw me into a story and often action horror tales don’t spend much time on character development. In amongst all the mayhem, Griffiths manages to flesh out Devon, warts and all. I found it satisfyingly realistic that he was strongly tempted to shoot his wife when given the opportunity, for example. And those lulls in the action scenes also provides plenty of gathering tension, backlighting the fight scenes with greater emotional investment. The scene setting is excellent, and clearly one of Griffths’ strengths. It is particularly crucial in this book that he manages to clearly portray the various backdrops to the action and at no time did I find myself floundering or backtracking to work out exactly where I was while it was all kicking off. Which is something I regularly have to do during action scenes, partly because my spatial awareness isn’t that wonderful – and partly because authors often tend to skim over the where and when as fists and bullets start flying. Not so, in Eternal Aftermath. Any niggles? Well, there were a few typos and the left-hand margin keeps indenting in an annoying way that I’m more used to seeing in self-published novels – and given that I wasn’t paying a rock bottom price for this book, I think the formatting issues should be addressed by Living Dead Press sooner rather than later. However – unlike a lot of self-published books – these glitches weren’t on the scale that significantly intruded, but this would have had a 9 if it hadn’t been for those – the writing certainly merits it.